While I purchased Minnie and Patty on the same day, Minnie came later that same day, so she is the last youngster added to the herd in 2004. Minnie is a red dun. 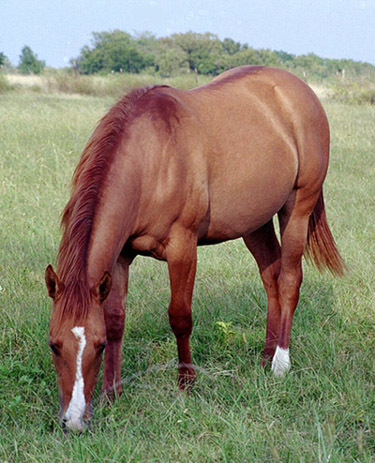 For those of you who might not know the difference between a red dun and a chestnut/sorrel, a dun has a much darker colored dorsal stripe down the back, from the base of the mane to the base of the tail. Minnie has a stripe that can be seen, very plainly, when standing behind her. Minnie was a little shy when I first brought her home, but has made great strides in becoming quite friendly. 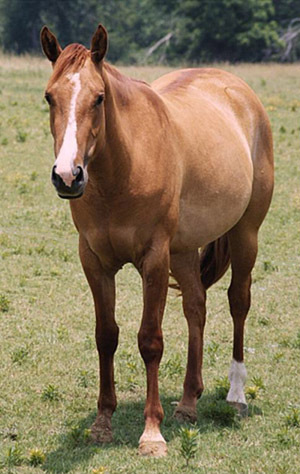 She has grown into a lovely mare that holds great promise for this farm.